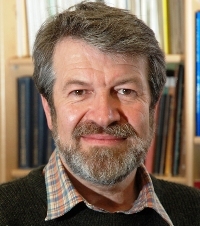 Hamish Campbell is a geologist and research scientist with the Institute of Geological and Nuclear Sciences in Wellington. Born in Christchurch and raised in Dunedin, he was educated at Otago, Auckland and Cambridge universities, specialising in palaeontology. Much of his research concerns the older rocks and fossils of New Zealand, those that are between 300 and 150 million years old. Another research interest is the geology of the Chatham Islands. However, he is best known as the geologist at the National Museum of New Zealand Te Papa Tongarewa, where he has become a science communicator, helping promote geology and provide geological information to the public.